This is a personal review City of Wonder, a casual social game on Facebook. I started playing City of Wonder about a month ago so bear in mind that I may not have unlocked all that there is to unlock. 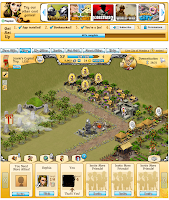 City of Wonder is a simulation game developed by Playdom and played on Facebook where you can create prosperous civilizations which will let you progress through the ages while researching various technologies. In short, City of Wonder is a streamlined, very social version, of Civilization which focuses more on city building. When starting out, you will be given a piece of land to cultivate. The tutorial and your advisors will help you reached several levels before setting you free on your own. There are a few numbers to keep track of when playing City of Wonder. Population is the number of people living in your city. To increase the population of your city, you have to build residential buildings or dwellings. To build a residential building, you will need coins. Some building require certain research to be completed before you are able to build them. Once a residential building is built, a timer will count down and when it finishes, an icon will float over the residential building indicating that people are ready to move in. Clicking on the building will increase your population by a certain amount depending on the type of residential building. Different residential buildings add different amounts of population and also requires varying lengths of time. Happiness sets the maximum number of people that can reside in your city. One of the ways to increase this number is to build cultural buildings and decorations. Both will cost some coins but will surely increase the happiness in your city and allow your population to grow. The same with residential buildings, some cultural buildings and decorations requires a certain research to be completed before you are allowed to build them. Coins are required to build things among other things. Coins can be earned in several ways, the simplest of which is to build Market buildings. Building market buildings will cost you some coins. Once, a market building is built, a timer will count down and when it finishes, an icon will float over the market building indicating that coins are ready for collection. Clicking on the market building will add a certain amount of coins to your total. Different buildings add different amounts of coins and also requires varying lengths of time. The number of market buildings you may construct depends on your population. 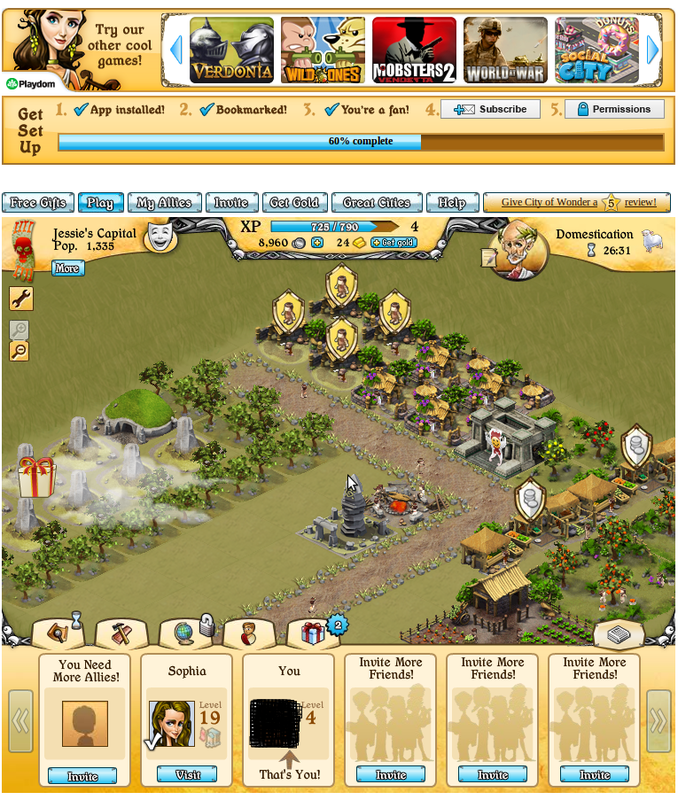 You may also earn coins using Goods buildings. You may construct Goods buildings which will cost you some coins. When finished, you can click on a goods building and choose which goods you would like it to produce. Different goods will cost you different amounts of coins as well as earn different profits and take different amounts of time to finish. The number of goods buildings that you may construct depends on the size of your city. XP or experience is used to determine your level. XP is gained by doing actions in City of Wonder. Earning a level will open up research options for you so that you can fulfill the requirements of the other buildings. All in all, City of Wonder is a social game that offers more depth than the other games out there and I feel it is a nice change.